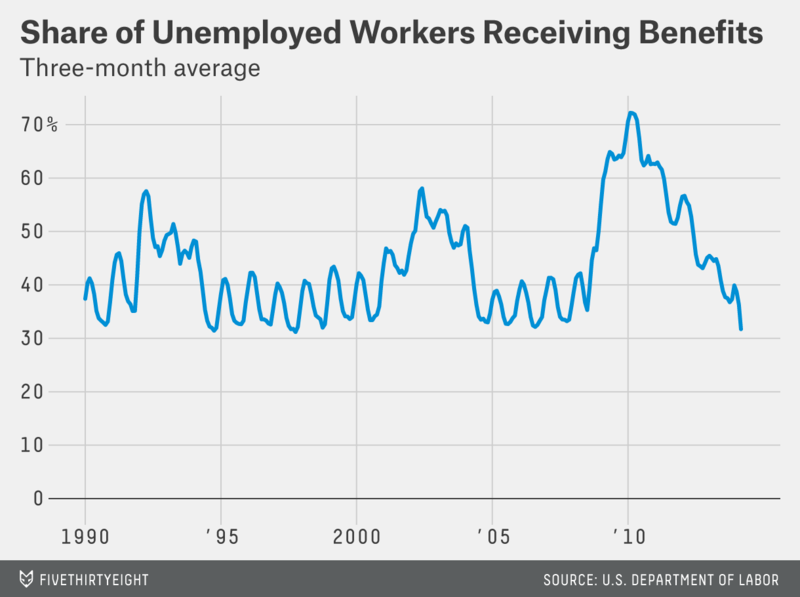 Fewer Americans are receiving unemployment benefits than any time in nearly six years. And yet there are 2 million more people unemployed than there were back then. Just over 2.8 million Americans were getting jobless benefits in mid-April, according to data released by the Department of Labor on Thursday. That’s the lowest level since May 2008, and it’s down from more than 10 million at the peak of the unemployment crisis. In dollar terms, payments are down $120 billion from the peak, a 74 percent drop, according to a separate report from the Bureau of Economic Analysis, also released Thursday. Two things are driving the divergence between jobseekers and benefits. One that’s gotten a fair amount of attention recently is the expiration of federal emergency unemployment benefits, which cut off payments to 1.4 million people at the start of the year. The Senate recently voted to restore the program, but Republican leaders in the House have rejected the plan. The end of emergency benefits is only part of the story, however. Even before the cutoff, millions of workers had simply reached the end of their benefits. That’s partly because state and federal unemployment programs have been pared back in recent years, but it’s mostly because many people who lost jobs in the worst of the recession still haven’t found work — and even at their most generous, unemployment benefits never lasted four or five years.